Salmon is the common name for several species of of the family Salmonidae. Several other fish in the family are called trout; the difference is often said to be that salmon migrate and trout are resident, a distinction that holds true for the Salmo genus. Salmon live in both the Atlantic (one migratory species Salmo salar) and Pacific Oceans, as well as the Great Lakes (approximately a dozen species of the genus Oncorhynchus). Salmon eggs are laid in freshwater streams typically at high latitudes. 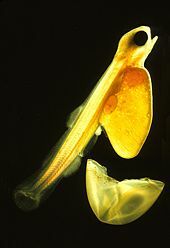 The eggs hatch into alevin or sac fry. The fry quickly develop into parr with camouflaging vertical stripes. The parr stay for 6 months to three years in their natal stream before becoming smolts, which are distinguished by their bright silvery colour with scales that are easily rubbed off. It is estimated that only 10% of all salmon eggs survive to this stage. The smolt body chemistry changes, allowing them to live in salt water. Smolts spend a portion of their out-migration time in brackish water, where their body chemistry becomes accustomed to osmoregulation in the ocean. To lay her roe, the female salmon uses her tail (caudal fin), to create a low-pressure zone, lifting gravel to be swept downstream, excavating a shallow depression, called a redd. The redd may sometimes contain 5,000 eggs covering 30 square feet (2.8 m2). The eggs usually range from orange to red. One or more males will approach the female in her redd, depositing his sperm, or milt, over the roe. The female then covers the eggs by disturbing the gravel at the upstream edge of the depression before moving on to make another redd. The female will make as many as 7 redds before her supply of eggs is exhausted.